NRL chief executive Todd Greenberg admitted Tim Simona's charity hoaxes that were part of their investigation into his betting scandal left him "sick in the stomach". Simona's NRL career was left in tatters on Friday after the governing body confirmed it had torn up his contract for a range of rule breaches including multiple wagers on opposition teams. But it was his ploy at auctioning off Wests Tigers jerseys and keeping the money that deeply affronted the game's boss. "All I can tell you is that he was putting forward opportunities to sell jerseys and putting that money to charities, and that money did not go to the charities," Greenberg said on Friday. "I personally feel sick in the stomach when I hear something like that. That's abhorrent." Greenberg said the 25-year-old had ripped off many of his buyers via social media, however it was unclear how many jerseys he had tried to sell or how much money he had stolen. "There were mechanisms online where he would put jerseys up for sale and he would purport that those funds would go directly to a choice of charity," he said. "What was clear to us in the investigation was that that was happening regularly but the money wasn't flowing through to the charity." Greenberg promised Simona the governing body would assist him as he confronts some personal demons, but made it clear he is unlikely to be allowed back in the game again. "This is an extremely sad situation. 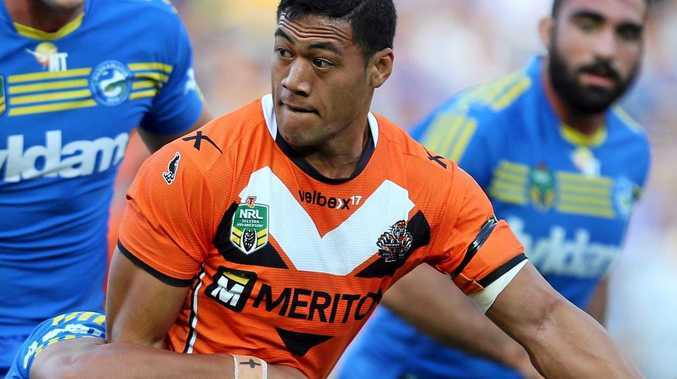 Tim Simona has a serious personal problem and he has expressed some remorse," Greenberg said. "He's worked very hard to become an elite athlete and an elite rugby league player. He has now thrown that away. "The game will continue to care for him. He will be provided with the welfare and assistance that he needs in this very difficult time. "But based on the evidence we've identified, it is very hard to imagine that Tim Simona will be registered with the NRL at any time in the future." The Tigers released a statement later on Friday, standing by the NRL's decision on their centre and are confident the Simona saga isn't a widespread issue. "As a club we pride ourselves on our standards of behaviour and after discussions with the NRL I'm 100 per cent confident that this is isolated to Tim Simona," Tigers CEO Justin Pascoe said. "At Wests Tigers we are very proud of our position in the community. We will not allow the actions of an individual player to jeopardise what this club stands for and represents."